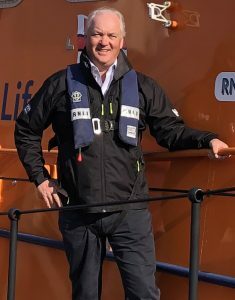 RNLI Salcombe are pleased to announce the appointment of Mr. Andrew Arthur to position of Lifeboat Operations Manager (LOM) following the appointment of Mr. Mark Dowie to Chief Executive of the RNLI in Poole. 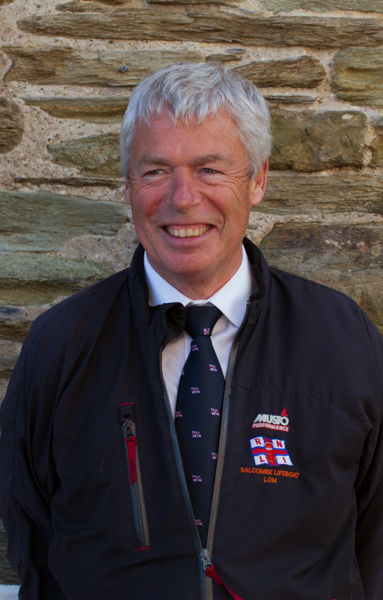 In this voluntary role, Andrew will be responsible for the Salcombe lifeboat station, its boats, crew and day to day operations, working closely with Chris Winzar, the Lifeboat Coxswain and Sam Viles, the Lifeboat Mechanic. Andrew, a former Royal Navy Lieutenant Commander Marine Engineer Officer, is still a keen sailor and has significant maritime and management experience to draw upon. Andrew now runs his own Bespoke Cabinet Making businesses in Salcombe. As Lifeboat Operations Manager, Mark has managed a very busy 17 months for the Salcombe Lifeboats, launching 64 times in 2018 with several services being lifesaving and high profile. The crew was also featured in the last two series of the BBC’s documentary “Saving Lives at Sea”. The Royal National Lifeboat Institution (RNLI) has today – Wednesday 6 March 2019 – announced that its new Chief Executive will be Mark Dowie. Mark is currently the Lifeboat Operations Manager at Salcombe RNLI in Devon, a voluntary role that he has held proudly since 2017, and will take up the post of Chief Executive of the lifesaving charity on Wednesday 15 May 2019. In his role as a Lifeboat Operations Manager, Mark has been responsible for all the operations of a busy lifeboat station, and so he has first-hand experience of leading and volunteering within the RNLI. Mark brings with him significant corporate leadership experience, having been a senior banking professional who was most recently Chief Executive Officer, Corporate & Institutional Banking, at Standard Chartered Bank. In this role he led the bank’s global wholesale banking business and was responsible for nearly 20,000 people in 62 countries around the world. A former Royal Navy Supply Officer, Mark served between 1982 and 1990, leaving the service at the rank of Lieutenant. During his time in the Royal Navy, Mark served on the helicopter carrier RFA Reliant and HMS Illustrious. In addition, Mark has owned and managed a successful marine services company and served as a magistrate in Devon. He is a keen sailor and a gyrocopter pilot. Mark is also a trustee of the Royal Navy and Royal Marines Charity (RNRMC) and has provided leadership and financial support to youth charities in south London and a school and orphanage in Kenya. Mark said: ‘I am delighted and incredibly proud to have been appointed as the RNLI’s new chief executive. Stuart Popham, Chairman of the RNLI, said: ‘I’m delighted to announce Mark Dowie as the RNLI’s new chief executive. ‘Mark has a range of impressive attributes and experience that he will bring to the role, including valuable experience as an RNLI volunteer. ‘He has a wealth of corporate leadership experience and a real affinity for the sea. I’m looking forward to working with Mark and am extremely confident that he will be a huge asset to the RNLI. The RNLI’s current chief executive, Paul Boissier, has been in post since 2009 and will leave the RNLI on Wednesday 15 May. 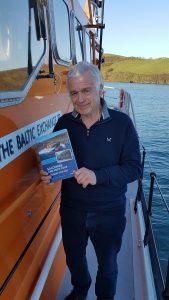 The fascinating history of Salcombe and Hope Cove Lifeboat Stations has been brought to life in a new 162 page book written by Lifeboat Museum Curator, Roger Barrett and published by the RNLI in its Station History series. Read about our brave volunteers and their lifeboats, from the past to the present, and how they have battled the elements to bring people to safety. You’ll be gripped by the tales of courage and determination in the face of adversity and you’ll meet some real local characters, like Eddie Distin, who narrowly survived Salcombe Lifeboat Disaster and went on to lead the Salcombe crew for 29 years. Over 160 illustrations. Available from the Lifeboat shop (weekends only until April 1st), Helly Hansen, Fortescue Inn, Salcombe DIY, Luscombe Maye, Will Bees Bespoke, Salcombe Yacht Club and Salcombe Garage. Price 8.95. Or order online by emailing salcombebooks@rnli.org.uk. All profits will help the RNLI to save lives at sea. 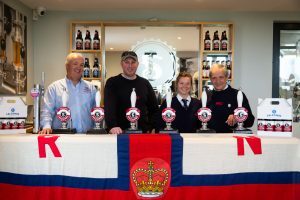 Salcombe Brewery Co is supporting the RNLI by donating 5p to them for every pint of their aptly-named Lifesaver sold in 2019, 150 years since Salcombe first established its own lifeboat station. The brewery owner, John Tiner, says: “We are thrilled to have the opportunity to support an important cause and help raise awareness of the invaluable role that the RNLI has played in our community for the last century and a half and to raise funds to support them in the continuation of this work.” Lifesaver (ABV4,8%) is a tasty bronze coloured ale which boasts a pleasantly malty flavour with a smack of citrus and orange peel. The initial citrus flavour gently fades into a subtle liquorice and toffee character with a floral finish. It is available on draft in bars and restaurants throughout the South West. 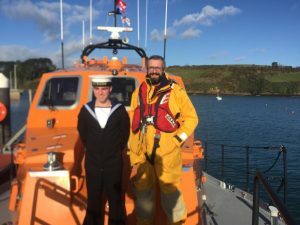 RNLI Salcombe volunteer Crew member becomes Able Seaman Nathan Dundas RN. 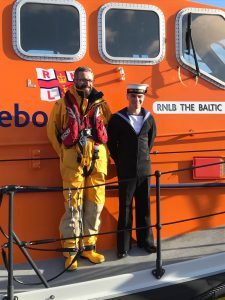 After ten weeks of basic training at HMS Raleigh, Salcombe volunteer crew member Nathan Dundas was passed out as an Able Seaman in the Royal Navy on Friday 1st February 2019. Joining the Lifeboat crew at seventeen Nathan became the second member of the family to be a part of the Salcombe crew, joining his Father Iain. Indeed, both had been on several ‘shouts’ together, one in particular where they were involved in the successful treatment and evacuation of a heart attack casualty. Joining the Royal Navy had been a long-held ambition for Nathan and when the chance presented itself, as he was about to turn eighteen, there was no stopping him. Although now a full-time member of the Royal Navy, Nathan has asked that he keep his position on the Lifeboat for as long as he can. http://217.199.187.64/salcombelifeboat.co.uk/wp-content/uploads/2016/06/salcombelifeboats1.png 0 0 RNLI Admin http://217.199.187.64/salcombelifeboat.co.uk/wp-content/uploads/2016/06/salcombelifeboats1.png RNLI Admin2019-02-04 07:50:032019-02-04 07:50:03RNLI Salcombe volunteer Crew member becomes Able Seaman Nathan Dundas RN. Salcombe RNLI Lifeboat Operations Manager, Mark Dowie, presenting a RNLI Chief Executive’s letter to South Sands Hotel Director, Stephen Ball. The letter thanked Stephen and his team at the hotel for all they did to make the 150th anniversary launch dinner such a great success. Thank you South Sands Hotel from all at Salcombe RNLI! 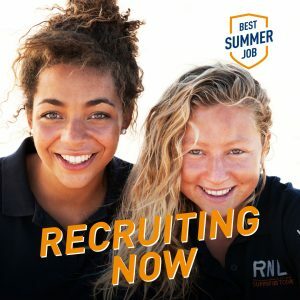 The RNLI’s Face to Face Fundraising team is recruiting! http://217.199.187.64/salcombelifeboat.co.uk/wp-content/uploads/2016/06/salcombelifeboats1.png 0 0 RNLI Admin http://217.199.187.64/salcombelifeboat.co.uk/wp-content/uploads/2016/06/salcombelifeboats1.png RNLI Admin2019-01-04 10:59:072019-01-04 10:59:07The RNLI's Face to Face Fundraising team is recruiting! 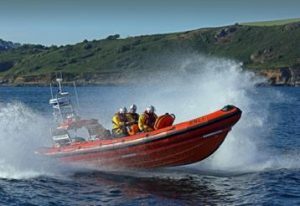 The draw for the RNLI Salcombe Lifeboats Grand Raffle took place on 14th December 2018 at The Thurlestone Hotel, Thurlestone, Devon. For all those who took part the winning numbers are as shown below. Our thanks go to all those who taking part in the raffle and by doing so helped the RNLI, the charity that Saves Lives at Sea. Christmas and New Year’s greetings to all Salcombe RNLI supporters. I hope you will find the following account interesting and informative – 2018 has been a busy year at sea and ashore. 2017 was by some margin a record year for the Station with 66 shouts split 39/27 between the All-Weather Lifeboat (“ALB”), The Baltic Exchange III, and our former Inshore Lifeboat (“ILB”), Joan Bate. 2018 has been just as busy so far with the current total standing at 63 shouts split 36/27 between the ALB and our brand-new ILB, Gladys Hilda Mustoe. December was busy last year so we will see where we end up. • 86’ fishing vessel (“FV”) – in late March, the ALB launched to reports of a fishing vessel on fire 15 miles south of Start Point. The vessel was located and a Lifeboat crew member was placed aboard the FV to check the fire was out and give casualty care (the engine room fire had been extinguished by the FV’s crew – as a matter of interest, Lifeboat crews are not trained to fight fires). One crew member was very unwell with smoke inhalation and so was winched to the Coastguard helicopter (924 from Newquay) from the FV whilst under tow by the ALB, then transferred to Plymouth hospital. The ALB then towed the FV and its remaining crew to the east for hand over to Torbay ALB off Dartmouth. This was a 7-hour shout from launch to being back on service. The picture below shows helicopter 924 manoeuvring to begin winching operations. The ALB was towing the FV into wind to give the helicopter some forward airspeed to assist hovering. 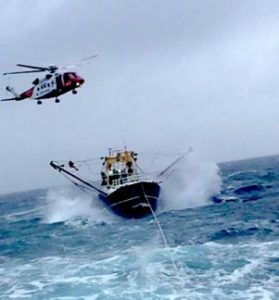 • 76’ sail training vessel – shortly after the service described above the ALB was called to attend to a seriously ill crew member aboard a Brixham sailing trawler 10 miles south east of Start point. 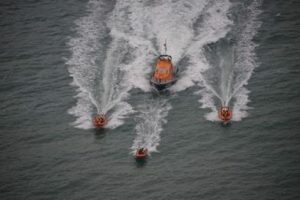 Whilst on passage to the vessel, the ALB was in close communication with Coastguard helicopter 924 and it was decided that both units would arrive on scene at the same time so that the ALB could pick up the winchman/paramedic first, and then transfer the winchman and 2 crew to the vessel. The casualty was then transferred to the ALB and then winched to the Coastguard helicopter. This process took 13 minutes from picking up the winchman to the casualty being winched and for the whole of this time CPR was being given; testament to the effectiveness of our regular exercises with Coastguard helicopter 924. Very sadly, and despite the best efforts of all concerned, the casualty didn’t make it, but we were very honoured to receive a visit from his family later in the year. The casualty’s daughter presented a cheque to the Station and told us how much she had appreciated the efforts made to save her father. This was a very moving experience for all. • A cow – one of the more unusual services this year was to a stranded cow, at the bottom of the cliffs near Hallsands Beach. Our brand-new ILB assisted the RSPCA and the cow’s owner with a tricky extraction and everyone returned home safe. We are occasionally tasked to assist with animals and often challenged about the sense of this work. The RNLI’s position is that stranded animals, or animals in distress, often result in people taking risks which will then result in call-outs anyway. Last year we twice assisted a humpback whale which had become tangled in fishing gear in Start Bay! Throughout the year both boats have been to a wide range of different services: fishing vessels needing towing out of the shipping lanes (these are often 12 hour shouts), medical emergencies within the harbour (our casualty-care trained crews are often the first to assist before ambulance staff arrive), injured and sick crewmen onboard commercial ships, missing and vulnerable people along the coastline (often assisting the Police and Coastguard teams), and the full range of mechanical failure, breakages and crew concerns in pleasure vessels of all shapes and sizes. When the call is heard we go – the ALB is capable of responding in any weather (in really extreme weather she might not get back into Salcombe though) and the ILB is ideal for fast response to anywhere up to 5 miles offshore in weather conditions up to a Beaufort Force 6. Apart from the two full-timers (Coxswain Chris Winzar and Mechanic Sam Viles), both our boats are crewed by volunteers. Current strength stands at 26 crew men and women who are supported by 5 shore crew, 9 launching authorities and one Medical Adviser. 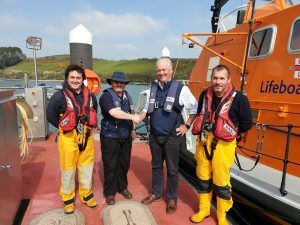 Recent changes at the Station include Simon Evans standing down as Lifeboat Operations Manager and being replaced by the author, and Rear Admiral Bruce Williams taking on the role of Chairman from David Grose. Thank you, Simon and David, for your years of service. 2018 has been a busy training year with a new and very comprehensive RNLI training regime being bedded in and several new crew to get up to speed. We hold training nights on Tuesdays and some Sunday mornings when both boats are launched to undergo specific operational training and/or conduct responses to specific scenarios (e.g. “go to an injured single-handed yachtsman in an uncertain position 3 miles south of Bolt Head”). We always work with the Coastguard during these sessions and also often conduct dedicated exercises with helicopters. The team is made up of busy people with jobs and families to juggle as well as their considerable RNLI commitments. They are called on at no notice for shouts but also have to help with the running of the two boats and the station. Their willingness to serve is nothing short of inspirational and the Station is a good-humoured and fun environment with a lot of banter and friendship. You are always welcome to visit. Our ALB and ILB lifeboats are in absolutely tip-top shape. The Baltic Exchange III is now in her 10th year of service and apart from some hull paint fading (she lives outside on the water, but this fading is a matter of great irritation to the Coxswain and Mechanic! ), she looks brand-new. She goes to Plymouth twice a year to be scrubbed off and re-anti-fouled so that the required top speed of 25 knots is achievable at all times. A full maintenance programme is performed on her throughout the year and she has achieved 100% readiness this year. Joan Bate, our much-loved 14-year-old Atlantic 75 ILB, was replaced on Station in January by a brand-new Atlantic 85 ILB, Gladys Hilda Mustoe. The new ILB is a fantastically capable lifeboat with an array of improved capabilities including radar, Radio Direction Finding, room for another member of the crew and increased speed and range. We have also taken delivery of a new Boarding Boat this year. This is a perfect lifeboat for work within the harbour and she is very similar to a D Class ILB albeit with a much lower equipment specification. • Joan hands over to Gladys – in January the weather broke for a couple of hours allowing us to conduct a very moving final exercise with our outgoing ILB, Joan Bate. For a couple of weeks, we were a four-boat Station and the photo below shows the “fleet” returning from exercise. This photo also clearly shows the difference in size between the Atlantic 75 and 85 lifeboats. For the crew who had looked after her for so many years this was a surprisingly emotional farewell but she was passed into the reserve fleet looking almost brand-new. In September, we were delighted to hear that Joan Bate had been stationed on the River Dart as a trial lifeboat and we have already been able to exercise with her again. • Visit to the Baltic Exchange – several members of the crew were entertained royally by our long-time supporters, the Baltic Exchange (the clue is in the name of the ALB), to a delicious and lavish lunch in their board-room. Through the kindness of the COMO Metropolitan Hotel, they were also able to recover from lunch in splendour in Park Lane. This was a very special trip for us and it reinforced the incredibly strong links we have had with the Baltic since 1963. • DAMAGE REPAIR INSTRUCTION UNIT (“DRIU”) at HMS Raleigh – in the Spring we were able to visit the Royal Navy DRIU facility at HMS Raleigh in Torpoint. A mixed crew of lifeboatmen and one lady lifeguard, from Salcombe, Dart and Plymouth lifeboats were treated to a full day of damage control instruction under the watchful eye of the RN. 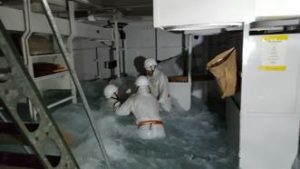 This culminated in a live exercise in the DRIU simulator when both teams saved the “ship”. This was a fascinating and instructive visit – many thanks to all at HMS Raleigh. 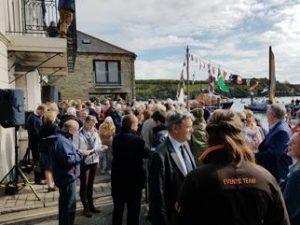 • Naming the Gladys Hilda Mustoe – on 1st May we held a formal naming ceremony for our new ILB and some 200 guests attended to wish her well. Our generous donor’s family and friends were well represented and her nephew, Clive Kirby, performed the ceremonial anointing by pouring Salcombe Gin over the bow (on the fibre-glass, NOT on the tubing). We were honoured to have the RNLI CEO, Vice Admiral Paul Boissier, with us and were able to put on a perfect ceremony in glorious spring weather. The Salcombe Gospel Choir sang Crossing the Bar as part of the service. We then took the ILB up to Kingsbridge and held a less formal but important ceremony presided over by the Deputy Mayor of Kingsbridge. The Crabshell Inn generously hosted us and some 100 people were introduced to the new ILB. 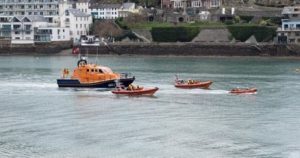 • Open Days – we held several very successful Lifeboat Open Days in 2018 and managed to show hundreds of enthusiastic people around both boats. Of particular note this year were the excellent rescue demonstrations organised by our Lifeguard colleagues and also the great success of the RNLI Face-to-Face team who signed up many new supporters. • Saving Lives at Sea – after last year’s exposure (involving whales etc.) we were again featured in (the first episode of) the BBC2 documentary Saving Lives at Sea. Crewmember and great-grandson of legendary coxswain Eddie Distin, James Cooper, was joined by Coxswain Chris Winzar, Second Coxswain Cameron Sims-Stirling, and crew members Dr. Kirsten Lafferty, James Marshall and Iain Dundas. Very embarrassing for those involved but a source of great pride for the crew. 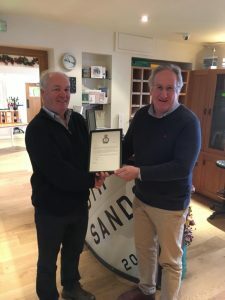 • 150th Anniversary Year Launch Dinner – in November, the South Sands Hotel treated 80 supporters to a spectacular 150th anniversary launch dinner with all proceeds going towards Salcombe RNLI. This incredibly generous gesture was instrumental in our achieving a grand total of over £27,000 raised on the night. We were also greatly helped by businesses and individuals including Salcombe Gin, Salcombe Brewery, Luscombe May, Prue Leith, the Red Arrows, and the Highgrove Estate. It was an amazing way to launch Salcombe RNLI 150. We are blessed in Salcombe with a superb team of fundraisers and supporters who organise and deliver a full programme of events throughout the year. 2018 has been no exception and Tim Chandler (our outgoing fundraising Chairman after several years) and his team have achieved a record result setting us a real challenge for the 150th year. 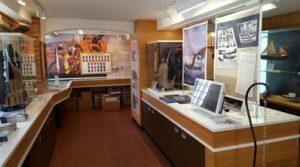 The Museum and shop have been run superbly by Roger Barratt and Jeanne Stevens and the whole team of committed volunteers are enormously appreciated by all at the Station. We are truly of “one company” and none of the lifesaving would take place without the work Salcombe Fundraisers do. And finally, to our 150th year. In 1869, and thanks to her donor, Sir Richard Durant, our first lifeboat, the Rescue, was launched at Dodbrooke Quay, Kingsbridge and rowed to her new home at South Sands which was built on land donated by the Earl of Devon. In 2019, we celebrate 150 years of commitment and service towards the Salcombe Lifeboat with a full programme of events leading up to a Lifeboat Festival over the weekend of 21/22 September. Our aims are simple: to spread the word and encourage support from all over the South Hams, to commemorate service and commitment over 150 years and to celebrate the future. There will be many ways you can get involved so please follow us through the website, on Facebook and Twitter. A Station history book (authored by Museum curator Roger Barratt) will be published in the Spring at the same time as a 30-minute documentary is released. This is being directed by supporter Chris Tizzard. Lots to look forward to. And finally, a big thank you from all of us at Salcombe Lifeboat Station to all of you for supporting us. We couldn’t do it without you.